Sam and I have been reviewing our older content lately to get a sense of our most read posts and topics. I’ve also revisited “the thigh gap” topic this week proof reading a paper I wrote that’s coming out in the Oxford Handbook of Food Ethics (Ann Barnhill, Mark Budolfson, and Tyler Doggett, editors) very soon. My paper is called “Food Insecurity: Dieting as Ideology, as Oppression, and as Privilege.” It’s almost five years since I posted these thoughts here on the thigh gap. And it and any other arbitrary thin ideal that makes people, especially women, feel poorly about themselves if they don’t achieve it, still makes me sad. It’s not the newest news, but the whole “thigh gap” thing, especially among young women, has been a simmering pot that came into media focus a couple of weeks ago when I was off the grid on a sailboat vacation. It was on the news and in the paper and on the web. It’s a popular hashtag on Twitter. Sam alluded to it in her post about bathing suit anxiety. The “thigh gap” aspiration is the newest thing driving young women to obsessive dieting and disordered eating. I am a woman in her late forties with no teenagers, so I’m a bit out of the loop sometimes. 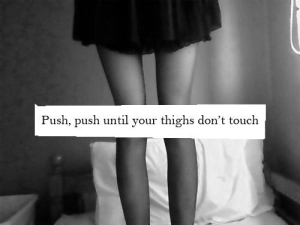 When I discovered the world of tumblrs (such as “fuckyeahthighgap” and “thigh gap” ) devoted to the thigh gap, I confess to being not just shocked, but profoundly saddened. Brilliant. Your paper is a topic I’ve been researching since college, in part as a function of my own recovery from anorexia. Self starvation in the context of poverty seemed to stump more than a few ER docs leaving me to go find my own answers. I also appreciate the idea of the body as self protection and how thigh shape or size, in contrast with other social determinants of efficacy meet. For me, the body was and still is a form of communication.